Remember that Samsung sliding QWERTY for T-Mobile that arrived on our radar a few weeks back? Carrying the model number of SGH-T699, the phone was found hanging in the wild and looking production-ready. 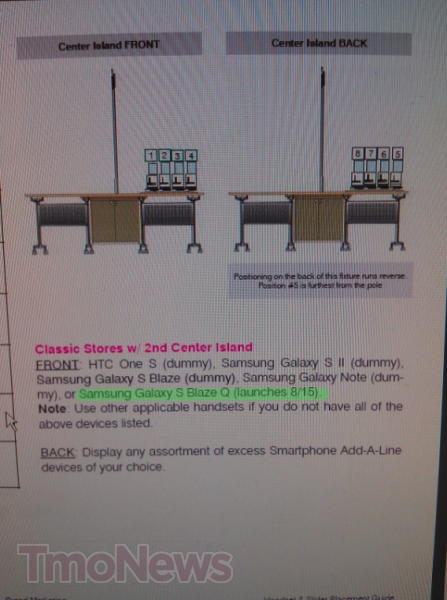 New details surfacing today suggest that it will be called the Samsung Galaxy S Blaze Q and that it will arrive on August 15th. We’re not big fans of the mouthy name for this phone but we’re happy to see a sliding QWERTY with mid-range specs. As the form factor is not all that popular these days, it’s something that texting lovers and socialites tend to like. Specs are rumored to include a 1.5GHz dual-core Snapdragon processor, 1GB RAM, 720p HD display, a pair-of cameras, and Ice Cream Sandwich (Android 4.0.4). Given the purported hardware, it’s likely that T-Mobile will not ask for more than $100-$150 for this phone, if that much. With just over a month before the expected arrival date, chances are good we’ll find out soon enough.